July 12th 10.30am The Place, a SLAMbassadors gig with headline performances from Hollie McNish and Akala. Contact jtaylorATpoetrysociety.org.uk for free ticket reservations. 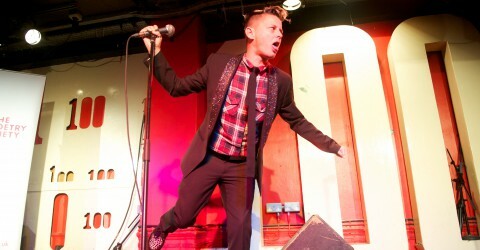 July 14th 11am Soho Theatre A SLAMbassadors gig with featured performance from Joshua Idehen. March 16 Find the Right Words Upstairs at the Western with Jess Green, Toby Campion and John Osbourne. March 24 7pm £15/11 Mother Foucault Loco Klub Clock Tower Yard Bristol BS1 6QH with Sabrina Mahfouz, Vanessa Kisuule and Salena Godden. March 31 7.30pm Bang Said the Gun Bloomsbury Theatre with Ross Sutherland plus Bang crew Rob Auton, Lauria Bolger and Dan Cockrill. April 14 Electric Kool Aid Cabaret with Andy Willoughby and Bob Beagrie among a host of Eurapean poetry stars. April 14-17 T-Junction Teeside International Poetry Festival featuring Jean Binta Breeze, Amir Dawish, George Szirtes, Tony Harrison, Shezea Quaraishi and many more. June 29th 7.30pm Out-Spoken The Forge, Delancey Street, Camden, London NW1 with Keith Jarrett, Karen McCarthy Woolf, Adam Kammerling and Shay D – plus floor spots from SLAMbassadors. The launch of our first SLAM anthology A Fistful of Heart, in partnership with Out-Spoken and the Poetry Society. September 30th – Brave New Word, SLAMbassadors 15 Years Celebration – House of Vans, Railway Arches, Waterloo Station London SE1 7-8.30pm. A magnificent line up including NAGA emcee, Ollie O’Neill, Megan Beech, Hussain Manawer, Sadia Ahmed and Anthony Anaxagorou. Shambala Festival somewhere in a field at some time or other. See you there. JAWDANCE at Rich Mix, Shoreditch. Apples and Snakes massively popular open mic night. Hosting. Queen Mary University, International Women’s Day celebration with Vanessa Kisuule and Bridget Minamore. Poetry Island at the Blue Walnut cafe in Torquay, with incredible line up of local poets including Lucy Lepchani, Robert Garnham and host Ian Beech. Hammer and Tongue London, feature slot with open mic slam beforehand. Speaking Volumes at British Library, Foyer area. European Literature Night. An amazing line up of British and European poets take over the British Library and prepare the stage for the legendary Saul Williams. Burning Eye Books gig in Bristol Libraries including Portishead, Keynsham, Yatton, and Midsomer Norton. Poets from the label will also be leading workshops and mentoring sessions for young people and adults in each of the libraries, and Clive Birnie will be talking about Burning Eye and his revolution in spoken word publishing. Email me for details. Free. JIBBA JABBA wicked spoken word night in Newcastle. Poets Vs Emcees, Brighton. I’ll be leading the Poets against the mighty Dizraeli. National Poetry Day Live at the Royal Festival Hall, Clore Ballroom FREE. Hosting an incredible line up of poets and spoken word artists with John Hegley – including Raymond Antrobus, Julia Donaldson, Jean Binta Breeze, Kei Miller, Joshua Idehen and exclusive films with Benjamin Zephaniah, Hollie McNish and Dizraeli. I will also be doing a set and am featured in a new film. I am particularly excited about this NPD as it has all been programmed by the Young Producers. SLAMbassadors Winners Showcase, with DJ Hussain’s House, Vj Harper and a headline set from Mark Grist. My favourite gig of the year! Book Club Boutique performing a set at the legendary BCB in Vout-O-Renee, The Crypt, 1 Prescott St, London EC1 Totally stupidly awesome salon hugging drink drenched smoky kind of night. BOOK LAUNCH!!! My new collection The Woman Who Was Not There (Burning Eye Books) will be launched at the Phoenix Arts Club 1 Phoenix Street, London (below the Phoenix Theatre) WC1, and will also feature some magical spoken word artists in support – Salena Godden, Anthony Anaxagorou and Raymond Antrobus plus a surprise guest. Radikal Words – feature set at an amazing North Eastern spoken word night. National Poetry Day: Live. Royal Festival Hall, Clore Ballroom. Hosting with John Hegley plus set. Free. 12-6pm. SLAMbassadors UK – judging day with Hollie McNish. All day Poetry Society. Outspoken. The Star of Kings, 126 York way, London N1 £10 7pm. Freestyle Fridays on Reel Rebels Radio. New weekly spoken word show featuring Joelle Taylor and The SLAMbassadors. Poetry film premier Isle of Skye. Poetry School – Spoken Word master class. Contact Poetry School for reservation and details. F.A.M.E event (Reel Rebels Radio) with John Hegley on board Stubnitz party ship. The SLAMbassadors will also be performing over this wicked 3 day festival. Heathmere Primary School – a part of the Poetry Society’s Look North More Often project where children help to write the poem that will decorate the Christmas tree in Trafalgar Square. The Aconbury Centre, Hereford. Performance and workshops. National Poetry Day Live. Host with Roger McGough plus 15 minute set alongside major UK poets, including Danny Abse, Grace Nichols and John Cooper Clarke. Free from 1pm in Royal Festival Hall, Southbank Centre. Poet in Residence at Royal Collections, Buckingham Palace for The Anantomist. Commissioned poetry and open workshop.